Let me just start out with a disclaimer — I am not from the South. I am a Yankee, which means I like my cornbread with half cornmeal and half flour and a drop of sweet and that’s that. If you are a true Southerner and wouldn’t dream of adding honey or sugar or maple syrup to your cornbread, I hope we can still be friends. I didn’t grow up eating it and I have no recipe that was passed down from my grandmother. But my husband and my kids love cornbread, especially at certain times of the year and I love preparing them good food that makes them happy. After I posted my Thanksgiving menu a few months ago, I had many inquiries about my cornbread recipe, so I figured I would share it just before the Super Bowl when you might be whipping up a big pot of chili. Even if you’re not eating something that goes well with cornbread, you will be delighted with this quick bread just by itself. My husband loves to split a wedge of the bread, toast it and slather it with a little more butter or honey or strawberry preserves for a nice treat. I typically like a barely sweet cornbread, which this is if you use 4 Tablespoons of honey. You can adjust the sweetness level according to your preference, but the best part about this bread is how moist and corny it is (even after several days.) I’m not sure anyone in my family knows that I add cooked quinoa to the batter. And it’s not because I’m the kind of person that sneaks healthful food into recipes and doesn’t say anything. I’m not clever enough for that. 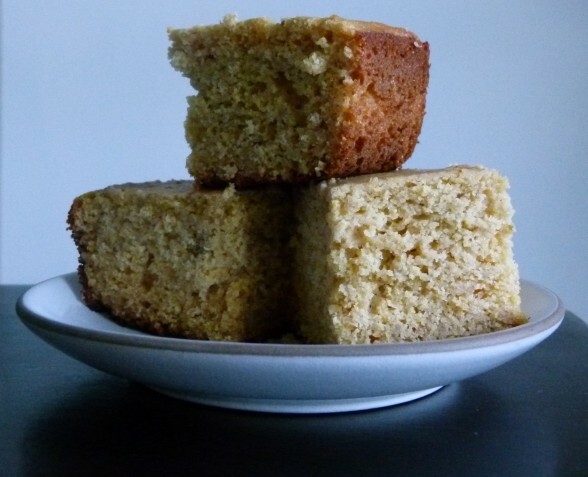 But I do try to use food efficiently and one day I had a bit of quinoa left in the fridge and since quinoa and corn go really well together, I decided to add it to the corn bread batter. You don’t notice it at all, except that I think the quinoa adds a nice moistness to the bread and a great boost of protein. 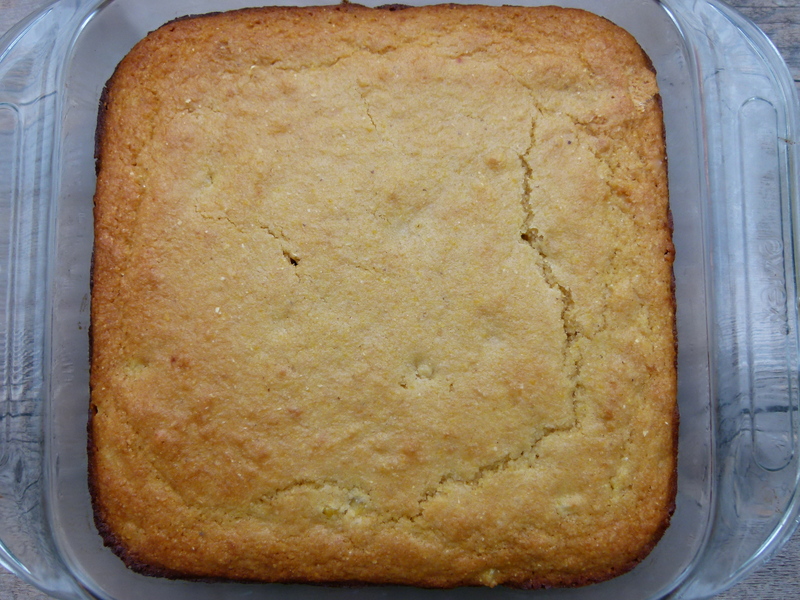 I’ve made this cornbread so many times with different combinations of ingredients based on whom I am feeding or what is available to me in the pantry and it has never disappointed. Although I’ve learned something about how certain foods affect the end result. 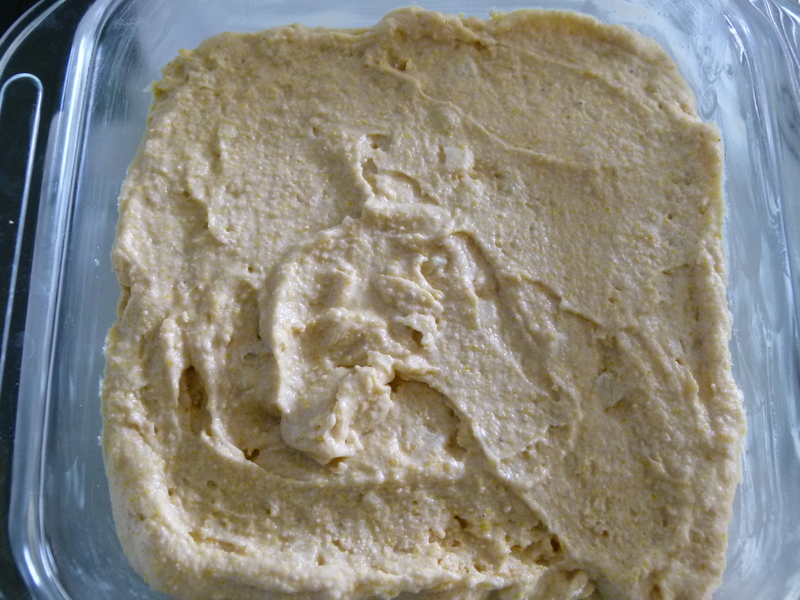 Dairy, such as milk and butter, result in a slightly more golden color to the finished bread. Coconut oil leaves a slightly sweet, subtly tropical aftertaste. The whole spelt flour is slightly coarser than whole wheat pastry, and made the bread feel a little more “whole grain.” If you use olive oil, you can taste it if the bread is still warm, but not after it has cooled a bit, but that will also depend on the kind of olive oil you use. Take this as a foundation recipe and have fun with it. Drop the honey and add diced cooked bacon, finely chopped jalapenos, or shredded cheese. Or prepare as is with some vanilla extract and blueberries or raspberries for a sweet treat. Are you entertaining for the Super Bowl? I would love to hear what you’re making. I am making guacamole and baked chips, but I’ll also serve it with jicama. I’ll make a giant pot of Vegetable Chili tomorrow and reheat on Sunday. I am also doing a Baked Potato Bar with lots of toppings (what in the world is easier to make than a baked potato?) I actually love a baked potato topped with chili! A big chopped salad and cornbread for sure! Daughter #1 told me she’s in charge of desserts. I’m nervous. Other fun foods for the big game can be Roasted Vegetable and Black Bean Enchiladas (especially the casserole version), a Taco or Fajita bar, Cilantro-Lime Slaw or a make-your-own sandwich bar with grilled chicken. I know my family in NY will be making some form of baked pasta, meatballs, sausage and peppers. Know your audience, I guess! If you have leftover guacamole and/or salsa after the game, save it for a great soup recipe on Monday. Have fun! In a large bowl, whisk together the flour, cornmeal, baking powder, baking soda and salt. In a medium bowl or a blender, combine buttermilk, melted butter, eggs and honey until well blended. Pour wet ingredients into dry ingredients and stir until just combined. Stir in the corn kernels. Using an ice cream scooper, divide the batter into the muffin pan or pour it into the prepared pan. ****To cook quinoa: Rinse quinoa and then cook 1 cup quinoa in 1 ¾ cups boiling water covered for 15 minutes. Remove from heat and allow to sit for 10 minutes, covered. Makes about 3 cups cooked quinoa. I live in the South but lived in the North for 37 years. Must be a learned taste but I definitely prefer Northen cornbread! My southern friends think it’s dessert when I make it as they find it too sweet. I find that funny since I don’t care much for sweet stuff and usually add less sweetener to my northern cornbread recipes as is! 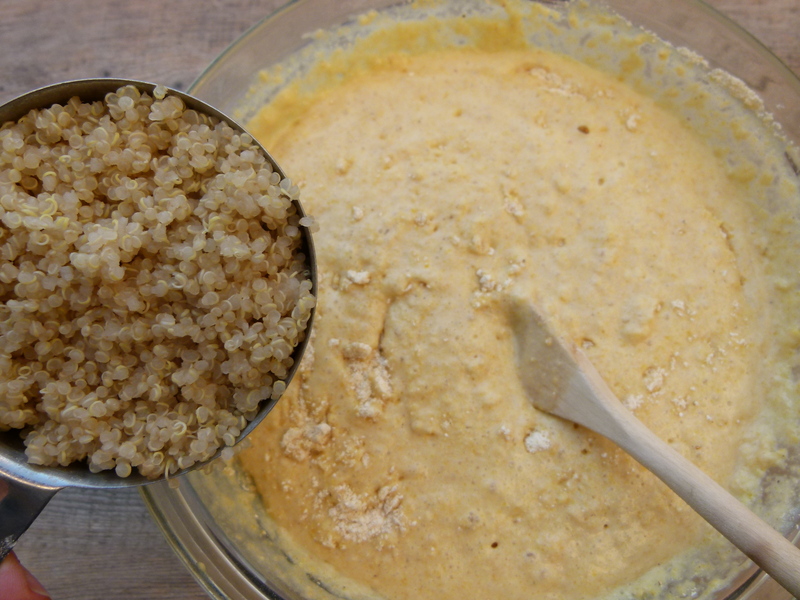 I’m going to try your recipe with the quinoa to make with the Mexican soup recipe I came onto your site for originally. Can’t wait to try both. OMG! This is the BEST cornbread I’ve ever had. I didn’t add quinoa, but I did make it with spelt flour. DELISH! Do leftovers need to be refrigerated? Yay! I would refrigerate it if you want to keep it more than two days. Then just toast it up in the toaster oven. OK, you rock! I was looking for a cornbread with quinoa recipe. Not only does this sound delicious but I really, really appreciate the substitutions you provided (eg. flax instead of eggs). Thanks! I used quinoa flour instead of wheat and used just 1/2 cup yogurt. Did not add cooked quinoa or corn kernels and followed the recipe using eggs, maple syrup and it turned out very good. Really?? That’s amazing! So you made it more nutritious and gluten-free. Way to go, Terri! Thank you for sharing! Would thia be a healthful option for a Thanksgiving stuffing in the bird ir out, i.e., for a cornbread stuffing? Hi Barbara, you can absolutely use this for a stuffing, but you just need to toast it first so it gets dried out. By the way, it is no longer recommended to stuff the turkey anymore. Less risk of bacterial contamination if you cook the stuffing out of the bird. The turkey cooks more quickly unstuffed, too! This was my first attempt at gluten free baking. I thought I would try is since the recipe also has corn meal and quinoa. It was a huge hit with our family! I also made ours dairy and egg free. 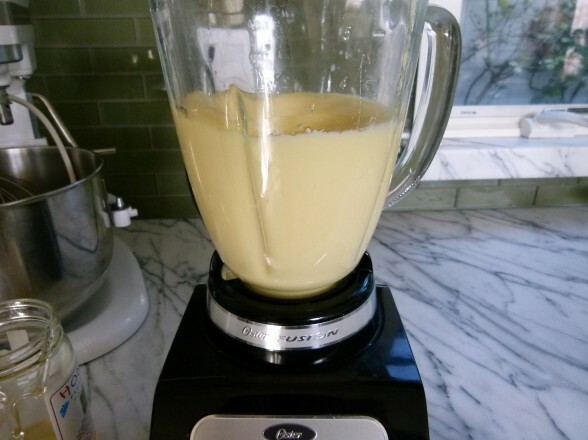 For the dairy I used 1 cup rice milk w/ 1 T. of apple cider vinegar. I didn’t have time to wait for the flax so I used 1 t. baking powder mixed with 1 1/2 T. each oil and water for each egg (i.e. I doubled this). It is not the most healthful substitute however it works well. Moist and delicious! This is great to know, Lisa! I’m so glad you wrote in. Thank you!! Wonderful and easy! Made the muffins with quinoa and used only half a stick of butter. They came out perfectly delicious. Stored them in a plastic bag in the fridge and they stayed moist for the next day too. Half a stick of butter, huh! So good to know that they still stayed moist the next day. Thanks for sharing, Gita! Once again, this was a recipe that was a huge hit around here! I doubled the recipe on SuperBowl Sunday and made 24 muffins. There was enough left over to make a small pan of bread too. We gobbled it all up, and we have been having the leftovers broiled in the morning for breakfast. The kids are begging for another batch. Since I have not gotten them to like quinoa (yet), this is a great way to get some of it in them. I also used spelt flour which was yummy:) Thanks for a great recipe!!! I am thrilled everyone liked it. Listen, if you already have cooked quinoa, this batter takes less time to put together than it takes the oven to preheat. Make some more! How much of this can I do in advance? Can I make the batter a day ahead of time? Quick bread batter generally doesn’t rise very well if it sits for too long. If you really need to do something in advance, you can mix your dry ingredients early, but you’re not really saving that much time. I think this batter comes together very quickly. I also think it tastes great the next day. Great easy recipe and tastes so good! Did the muffins, Matt really enjoyed it. Perfect timing. I was already making your chili for dinner and these will be the perfect addition. They smelled so good coming out of the oven I couldn’t wait until dinner. They are delicious! And so easy, right? Sounds like a yummy dinner! For Super Bowl I make roasted jalapeno “poppers”. Use about 3/4 parts goat cheese with 1/4 part cream cheese, salt to taste and stir together. Half jalapenos lengthwise and remove seeds and membrane (whatever you call that stuff inside). Slather cheese inside jalapeno “boats” and cover each one with slices of prosciutto. Roast in oven at 400 degrees for about 20 minutes. A crowd pleaser for sure! Wow! I’m obsessed with goat cheese and I love all chili peppers, so I’m going to make a few of these for sure! I bet you could prep them a little in advance and then pop them in the oven at the last minute. Thanks so much, Julie!